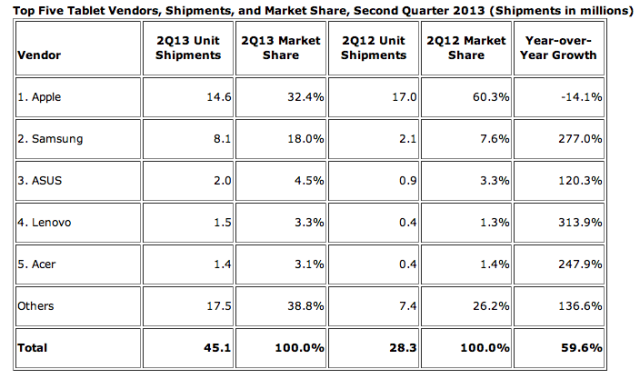 Despite no product launches in early 2013, Apple’s mobile market share is growing, but only on the smartphone market. On the tablet market side, the picture isn’t looking good at all: it has fallen 14.1% on a year-over-year basis, according to reports published by Canalys and IDC, respectively. As the most recent quarterly earnings already have shown, Apple’s iPhone sales doesn’t seem to slow down, and the forecast for the next quarter also is positive, as it ramps up for product launches. 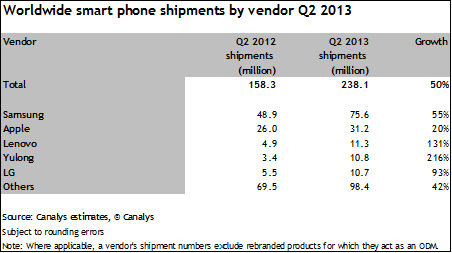 Canalys has published its own findings about the smartphone market and says that Apple and Samsung have managed to grow their smartphone shipments in the second quarter of 2013 by 20% and 55% respectively. 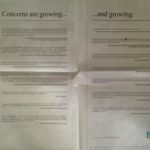 This comes despite the fact that they apparently are losing Chinese customers. When it comes to tablets, IDC has the numbers: Apple’s strategy to push its product launches to the second half of the year has affected its overall performance on the market. While other OEMs have posted an impressive up-to-300% rise in tablet shipments, Apple’s year-over-year growth is negative: -14.1%, and its market share — according to the IDC estimate — currently stands at 32.4%. 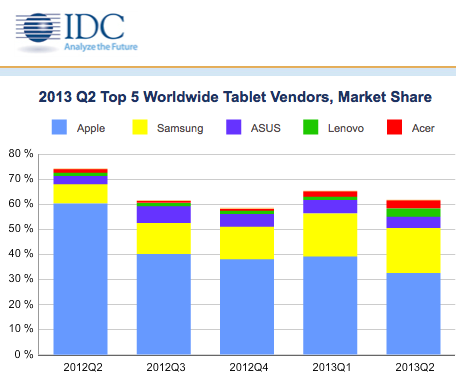 This is almost half of its year-ago market share. The most interesting part is that despite its negative growth, Apple still holds the biggest chunk of the tablet market, while Samsung — which posted an impressive 277% y-o-y growth — currently owns 18% of the tablet market. Yet again, we need to note that IDC’s numbers reflect shipments, not sales, so it is unclear how many of the shipped devices have found their way to customers.